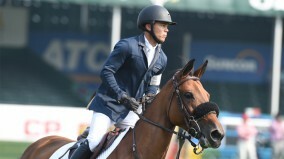 Kent Farrington was injured in a fall while competing Evergate Stable LLC’s Lucifer in the 1.30-meter jumpers in the Mogavero Ring at the Winter Equestrian Festival. Farrington, 37, is currently ranked No. 1 in the Longines FEI World Rankings and has held the No. 1 ranking for 10 months. He also leads the Rolex/USEF Show Jumping Ranking List. He served on the silver medal-winning U.S. team at the 2016 Rio Olympic Games. Farrington had an injury to his lower right leg and was transported to an ambulance, which took him to the Wellington Regional Medical Center. We will update his condition when more information is available.